You will receive an email with a link to the online course within 12-24 business hours (usually much quicker), after purchase, from eLearning.heart.org. Click on the link included in the email to access your online course. Click here for E-Learning course refund policy. Please check your spam folder if don’t receive your email receipt and/or email with the course link. HeartCode BLS is the online portion of BLS blended learning. It uses a variety of eLearning assets such as dramatizations, eSimulations, animations, self-directed learning, and interactive activities to teach students BLS knowledge and skills. After completing the online portion, students will attend a structured Instructor-led course that focuses on meaningful skills practice, debriefing, team scenarios, discussions of local protocols and skills testing. Where available, students may also complete the hands-on portion with a voice-assisted manikin (VAM). This course replaces the BLS for Healthcare Providers Online Part 1 (#90-1403), HeartCode BLS Part 1 (#90-1404), and BLS for Prehospital Providers Online (#90-1433) 2010 Guidelines courses. Participants usually require 1 hour or less, to complete the online portion. You must also complete the skills testing with an AHA BLS Instructor. This will require more time and is dependent on the individual instructors. What are the advantages of BLS Online? Establishes a standardized training program. Provides training when it is convenient for you (24 hours a day). Allows instructors to train more people with increased efficiency. 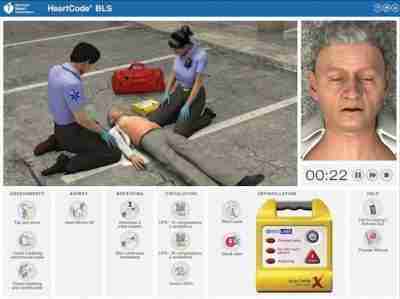 What are the components of BLS Online? Complete the online portion (Part 1). Have an authorized AHA instructor complete the skills testing (Part 2). The AHA instructor will issue the American Heart Association Healthcare Provider CPR certification card. How do I get my BLS card? You will need to have an American Heart Association™ BLS instructor complete the skills check off and issue your AHA course card. Once you receive your email with the link to your course (see sample here), you must contact AHA Tech Support at 888-242-8883 for any assistance. These courses are provided by the American Heart Association® and A.C.T.N.T. Healthcare Services is not able to provide any tech support other than related to the actual sale of the access link.